Gleek and Fleek were the seventh son of a seventh son. Hailing from the isolated, sleepy town of Arco, Idaho (pop. 87,) the two had a very linear family tree. Too much of a good thing when it comes to genetics can give unpredictable results. 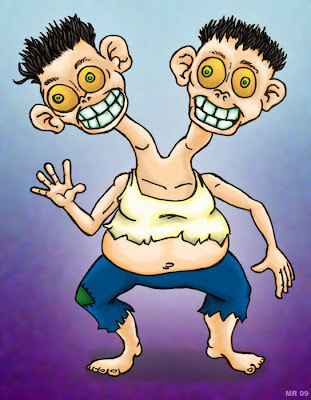 Thus Gleek and Fleek's peculiar predicament - the boys are two independent heads that share one body. One head controls each side of the body, and the two are incredibly coordinated, enough to perform complex tasks such as driving a car, cooking, playing computer games, etc. The future looked bleak for Gleek and Fleek until they signed a contract with the Red Circle circus company. The two were showcased alongside Bubba the Fish and Serpenzo the serpent boy, and eventually earned enough to retire in style.